Start or stop the scheduled events. When stopped no events will be performed. 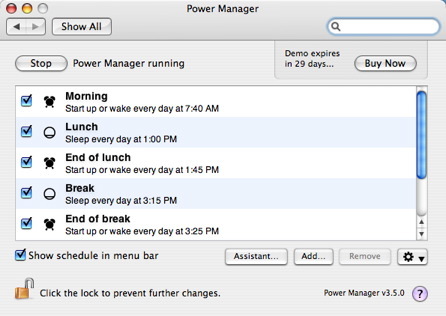 This button only affects the Power Manager scheduler. When stopped you can still add, edit, and remove events. You will rarely need to start and stop Power Manager; on those rare occasions use this button. Individual events can be enabled or disabled by checking their entry in the main table. Buy Now takes you directly to the Power Manager purchasing web page. You need to be connected to the Internet. This button is not visible on a licensed copy of Power Manager. Enable this check box to show a status menu item in your menu bar. This option affects only the current user. Each user can decide to show or hide the menu status item. The Schedule Assistant offers an easy way to set up your schedule. The Schedule Assistant walks you through a series of questions and then creates a schedule based on your answers. You can undo changes made by the Schedule Assistant. Add new events to your schedule using the Add button. The number of events you can add is only limited by available memory and disk space. You can undo changes made when adding an event. Removes all selected events. The selected events are removed immediately and any associated pending events are cancelled. You can undo changes made when removing events. The Action menu groups a few less-used options in Power Manager. The odds are you will visit each once or twice but not frequently. This menu option takes you to the about screen for Power Manager. The notification preferences control when and what options are presented before a pending event occurs. Some options require restarting because Power Manager alters the security rights for your Mac; this is the best way to be sure the new settings have taken effect. For more information see System Preference Reference > Notification Preferences. Power Manager can import schedules in XML/Property List Format. The imported schedule replaces the existing schedule. Power Manager can export its schedule to XML/Property List Format. Exporting a schedule does not affect the schedule or pending events. After buying a licence you will need to enter your details and code. This menu option displays a window for you to license Power Manager. For more information see System Preference Reference > Licence. Power Manager requires administrator rights to make changes. The padlock must be unlocked before any changes are possible. When the padlock is locked, buttons that make changes will be disabled. Click on the help button to open the built-in help guide.